Box.net, a popular online storage service, added an option that allows its users to create and edit documents and spreadsheets using Google Docs, but without leaving Box.net. 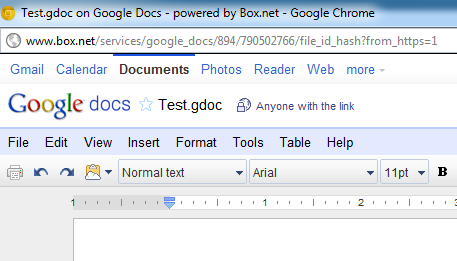 The files are stored by Box.net, but they can be edited using the regular Google Docs interface. "Beginning today, Box's 6 million users can easily create and collaborate on Google Docs and Spreadsheets from within Box, as well as edit the existing 50M+ Word and Excel files already stored on our platform. Google Docs enable entirely new forms of collaboration – like concurrent editing – that are impossible within desktop applications, and now these capabilities are easily available to Box users. We believe that the combination of Google Docs' collaborative editing and Box's content management will transform the way people work," suggests Box's blog. The integration has a lot of quirks: Google Docs still displays the navigational bar and some options that only makes sense for Google's services. 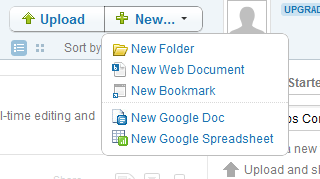 When you edit a document from Box.net, the file is temporarily added to the Google Docs list, but it's quickly removed after the editing window is closed. At some point, Google Docs will also add support for third-party apps, so it will be interesting to see if this feature will be better implemented. Would love to see something similar for Dropbox! Let me do quick, simple edits of my files inside Dropbox's interface, not replace MS Office. No perpetual cross-app incompatibilities. Then let Dropbox charge $3.99/mo for the privilege...I want them (and their competitors) to stay in business.